Life is nothing without friends. Anyone should struggle to make new friends as they can make the life more enjoyable and beautiful. We should celebrate each happy moment of life with friends. However, if there is any health issue with your friend, you can use get well soon messages for friend. It is necessary to take care of your friends at the time of need. You can wish him to get well soon messages and also can acquire his health time to time. For this purpose, you just need to pick the following valuable messages. My friend, you are a most precious heritage of my love. My ailment seems like my own ailment. I cannot see you in this condition. I am sure you are getting well rapidly. As your friend, I can easily understand your feelings and heart wishes. Believe me, I am always with you and will provide you complete assistance. Get well soon! When I see you in pain, I cannot control my tears. I pray to God to give you proper health soon. My dearest friend, best wishes for your recovery. You are not just a friend for me. You are also my good wisher and protector. I am doing everything which can give you pleasure in this condition. Get well soon. When I listened about your sickness I felt too bad. I am continuously worried about you. I am coming to take care of you right now. It is my pride to be your friend till my last breath. 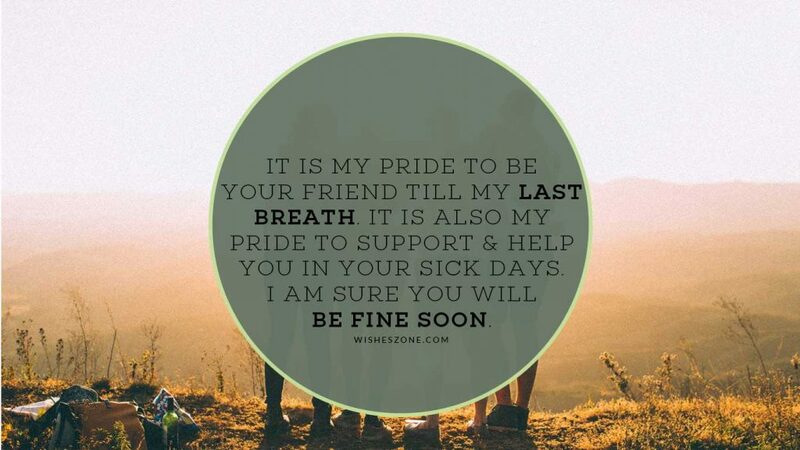 It is also my pride to support and help you in your sick days. I am sure you will be fine soon. My friend, never lose courage as you have already faced many worse conditions in life. This ailment is just a part of life and you can learn many positive things from it. Never suppose that you are alone. I, your family and all of our other friends are ready to serve you. We all are continuously asking about your health to your doctor. Please get well soon. I know you are a full of energy friend. No one can beat you because you have real power to defeat all bad situations. Accept my best wishes for your better health. I am missing those days when we were together to enjoy. Therefore, I want you to recover as soon as possible. My friend, take great care of you. My friend you are not responsible for your bad health. It is by God. 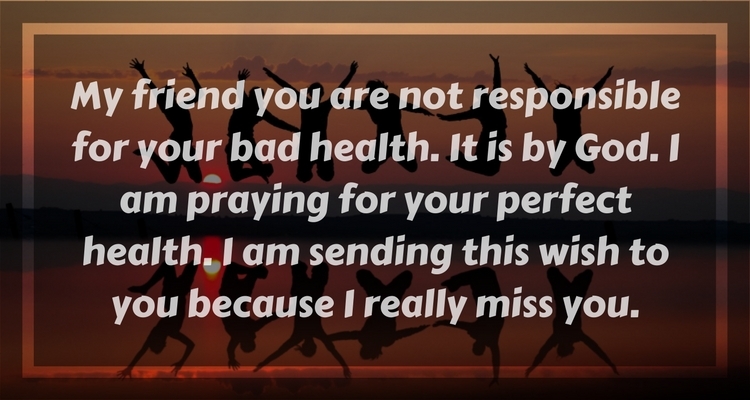 I am praying for your perfect health. I am sending this wish to you because I really miss you. You should take complete rest because your health demands this. Don’t worry, you will be absolutely good much soon and then you can come back to your daily routines. I think everything of this world is sad because of your health problems. I also think that everything is praying for your good health. My friend, get well soon. My friend, I am missing your advice in every matter of my life. I cannot wait anymore and coming to serve you throughout the process of your recovery.